1. Following verbs when used in active voice, take infinitive without to. I didn’t notice him go. Note: In passive these verbs (except Let) take infinitive with ‘to’. He was made to sing. I was bidden to go. 2. Following words take bare infinitive after them. Had better, would rather, would sooner, sooner than, rather than, had sooner. 3. Bare infinitive is used after conjunction ‘than’. She is better able to speak than write. 4. Have/has/had + noun/pronoun, is followed by a bare infinitive. I will have him realize his mistake. I had him know his mistakes. 5. ‘But’ and ‘except’ take the bare infinitive when they follow do+ nothing /anything/everything. I can do nothing but protest. 6. If two infinitives are joined by ‘and’, the ‘to’ of the second infinitive is usually dropped. I intend to sit in my room and read novels. A preposition is always followed by a gerund not by an infinitive. This is a good rule. It has no exceptions. If we want to use a verb after a preposition, it must be a gerund. It is impossible to use an infinitive after preposition. 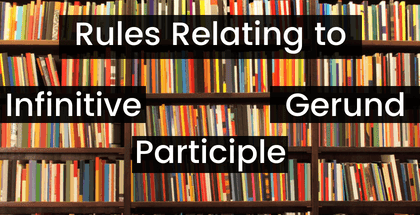 A participle is a verbal adjective, so it must be attached to some noun or pronoun. It means it must have a proper subject of reference. If the participle is not attached to some noun or pronoun it is called dangling participle. Waiting for the train, a brick fell on my feet. It appears that the brick was waiting for the train, which does not make sense. A participle linked in this way to the wrong noun/pronoun is said to be misrelated or the participle ‘waiting’ has no noun or pronoun to which it is attached. The above sentence should have been written as follow. While I was waiting for the train, a brick fell on my feet. When watching films, I find commercials especially irritating. When I am watching films, commercials are especially irritating. Note: A dangling participle is one that either has noun or pronoun to modify or else is not close enough to the word it is supposed to modify to prevent it from attaching to another element. In either case, the sentence is both ambiguous and nonsensical. Dangling participles are not considered acceptable in Standard English, so they should be avoided in writing. However, some participles such as considering, regarding, concerning, taking, speaking, touching, do not need to agree with the subject of the sentence. Considering the price, the quality of the cloth is good. Speaking roughly, the distance between Kerala and Bangalore is 500kms. Taking every point into consideration, the proposal is very attractive.